You really don’t have to travel far from Lisbon to find some amazing beaches. In fact, some of these Sintra beaches are among my all time favourite beaches in Portugal. 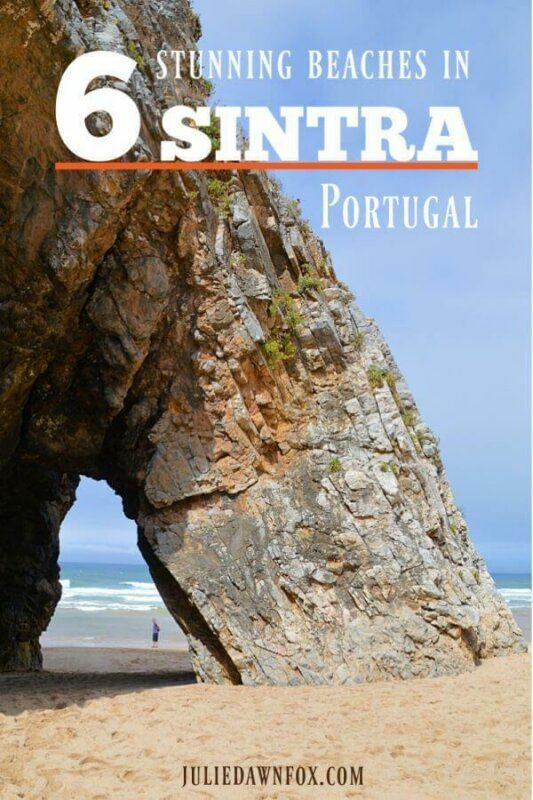 All of them are within the beautiful Sintra Cascais Natural Park and therefore largely unspoilt. They range from hidden coves to great expanses of sand so read on to find out which ones you want to visit. This was love at first sight for me, even before Mike and I got to Adraga beach itself. 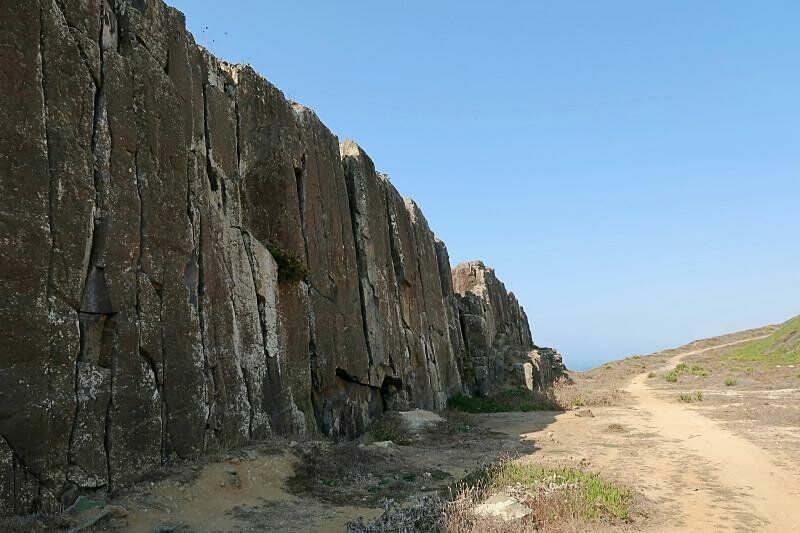 After negotiating the narrow streets of Almoçageme village, we drove downhill, through green countryside, to find a car park right behind the sand and the stunning rock formations of Praia da Adraga. One of the main draws here is the rocky archway jutting out from the cliffs to the left of the beach as well as the smaller chunks and clusters of rocks along the stretch of sand. At low tide, this is the perfect spot for a stroll. Be aware that the water can get quite rough, especially at high tide, so it’s not necessarily the best beach for swimming and you should be vigilant with children. There will, however, be plenty of shallow rock pools to explore at low tide. The beachfront restaurant, Restaurante Adraga is deservedly popular – we were lucky enough to nab the last table one lunchtime so I can vouch for the freshly grilled fish. There’s also an informal bar/café for quick refreshments. You’ll need a car to get here, unless you take a bus to Almoçageme and walk the last kilometre or two or come here on a guided walk (contact me if you want to do that). Note that in summer, the car park gets full quickly. If you wish to stay in this area, Pensão Sisudo is a nice bed and breakfast in Almoçageme with a good restaurant attached. 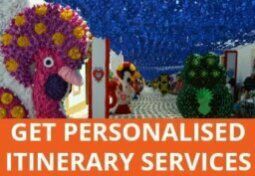 Otherwise, there are several holiday cottages to choose from. As you head down the ramp to Praia do Magoito, you should do two things. First, take a moment to appreciate the dramatic cliffs surrounding the wide stretch of sand. Second, take a closer look at the wavy formations on your left. These curious shapes are actually fossilised sand! The seawater here is noteworthy too. It has a particularly high concentration of iodine which is good for you in ways I don’t fully understand. You will see people enjoying free thalassotherapy in the shallows. There’s a restaurant/café here and lots of car parking, although this will be crowded in summer even if the sand is not. If you don’t have a car, you can take the #444 Scotturb bus from Portela da Sintra. 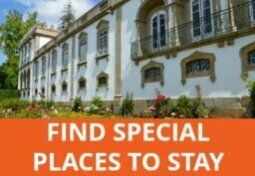 There are several accommodation options near Praia do Magoito – see which suits you best. The electric tram that trundles between Sintra’s historical centre and this sandy, partly sheltered beach goes some way towards explaining its popularity. However, its natural beauty does the rest. In summer, this is a very popular spot for families and there are several accommodation and restaurant options in the small village directly behind the beach. Also in high season, there are several beach activities, mostly aimed at children. Parking can be tricky at peak times so if you can’t take the electric tram, it might be easier to take the #441 bus from Portela da Sintra or a cab. 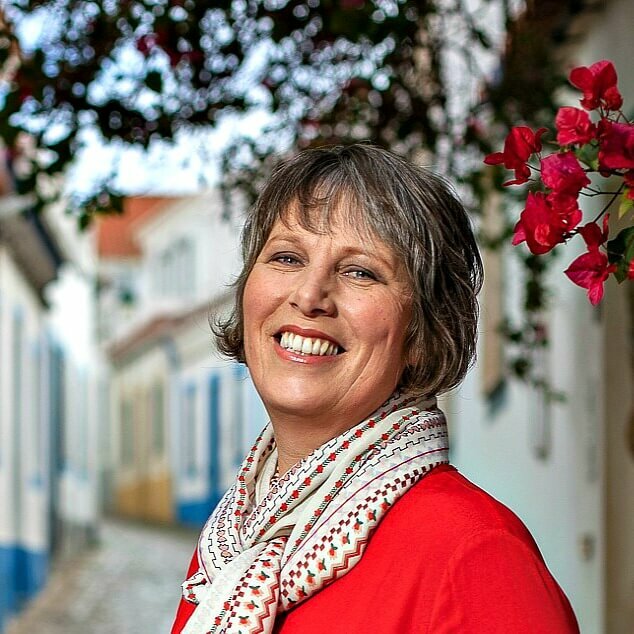 Another option, which includes other great Sintra beaches mentioned in this article and time in Sintra itself, is this guided tour from Lisbon. If you’d like to spend a night or two here, check out the various accommodation options. Praia Grande, aka big beach, lives up to its name with an enormous expanse of golden sand. At one end, the jagged cliffs bear the imprints of dinosaur footprints. At the other, a hotel complex provides a large outdoor swimming pool for safe, wave-free bathing. In between, you should have no difficulty finding a space on the sand, except at high tide, or in the surf if that’s your thing. There are a series of beachfront cafés and restaurants to keep you satisfied throughout the day. If you don’t walk here from Praia da Adraga (see this post for details of hiking trails in Sintra), the best way to get here is by car/taxi as there are no direct buses from Cascais or Sintra. This wide sandy beach is just around the corner from the pretty town of Cascais, before the Sintra cliffs begin. Guincho beach is really not ideal for swimming but if you need waves and wind for your water-based activities, this is the place to come. For surfers, kitesurfers and windsurfers, and those who like to watch them in action, it’s ideal. There are beach bars and nearby restaurants as well as places to hire equipment or get lessons. If you’re not driving, you could cycle from Cascais or take the #405 or #415 bus or a cab. 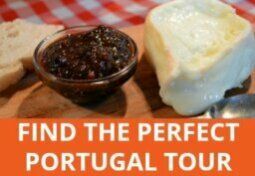 Alternative, this small group foodie tour of Sintra and the surrounding villages makes a stop at Praia do Guincho. Or treat yourself to a night at the Fortaleza do Guincho Pousada (the yellow building in the photograph above). The onsite restaurant is also a great place for a sunset dinner. 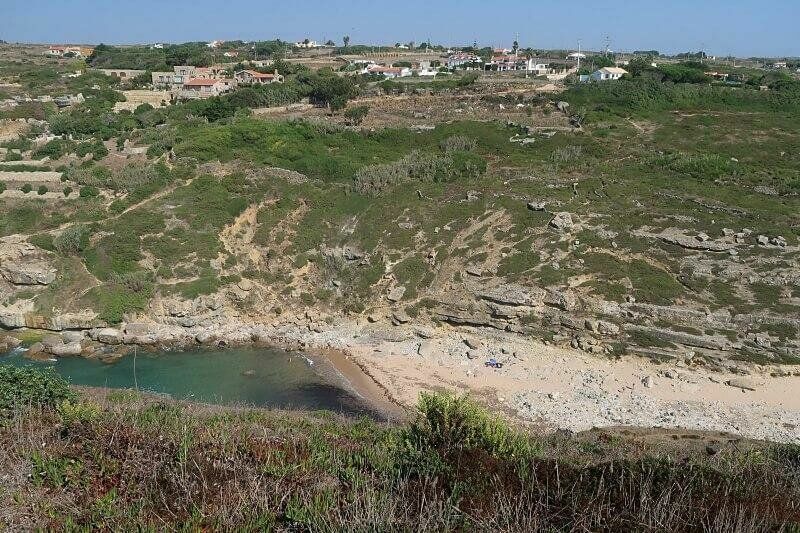 Towards the northern end of the Sintra Cascais Natural park Samarra is one of the lesser-known Sintra beaches. This narrow inlet has a small sandy beach banked by low cliffs. Dori and I visited after going to see the curious rock formation known as Lomba dos Pianos, which does rather resemble a piano keyboard. There is a footpath that runs along the cliffs from Lomba dos Pianos and down to the beach but the descent was too steep for our liking so we drove a (very) long way around to find the road access to Samarra. The water here is relatively calm and marginally warmer than at less sheltered beaches so we were able to enjoy a refreshing dip. It’s not that easy to get to – you’ll need a car and be willing to drive on an unpaved road but there is some parking on the descent to the beach. There are no cafés or facilities here so bring whatever you need with you. Previous Post: In-depth Expert Guide To Algarve Golf Courses. Which Is Best For You? These sound wonderful to visit but we want to live where we can walk to the beach! Looking forward to visiting Portugal from 17May. Are dogs allowed in the National Parks? The Western coast is fantastic! Just back from 10 days in Portugal. Can’t wait to return! 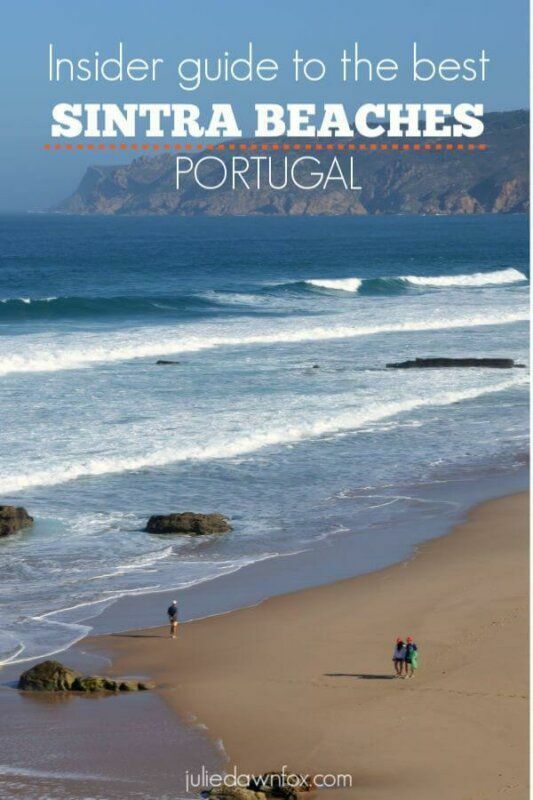 I’ve only been to Praia das Macas and to Praia do Guincho, but the others are beautiful too Julie.